The goal of ESG Lab reports is to educate IT professionals about emerging technologies and products in the storage, data management and information security industries. ESG Lab reports are not meant to replace the evaluation process that should be conducted before making purchasing decisions, but rather to provide insight into these emerging technologies. Our objective is to go over some of the more valuable feature/functions of products, show how they can be used to solve real customer problems and identify any areas needing improvement. ESG Lab's expert third-party perspective is based on our own hands-on testing as well as on interviews with customers who use these products in production environments. 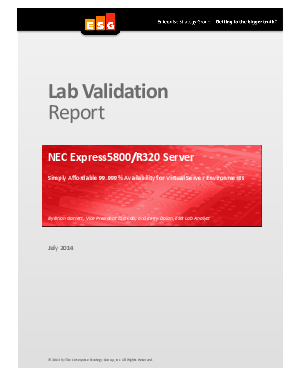 This ESG Lab report was sponsored by NEC Corporation of America.